The 1911 census and his military record say that Frederick Stopps was born in Thame around 1869, but exactly when and who his parents were is not recorded. Other census records indicate that he was born in Lambeth, London, although in 1881 he was at school, boarding with a local boot and shoe maker in Great Milton, near Thame. He married Ann Osborn at St Peter’s church, Walworth, on the 1st January 1891. They had eight children, although only five survived infancy, all born in the Lambeth and Camberwell area. Frederick was a carman (a driver of horse drawn transport for goods), and it was his work with horses that probably led to him enlisting with the 6th Dragoon Guards (Carabineers) at Peckham, London, in August 1914, service number D/10208. The regiment was part of the 2nd Cavalry Division (the same as the Queens Own Oxfordshire Hussars in which many Thame men served), and took part in many of the main battles in France and Flanders during the war. It was during the final advance through Picardy that Frederick died of heart failure on 29th October 1918 at the age of 47 years. Although records only give his rank as private, his wife Ann received his accrued back pay in 1919, which included a war gratuity of £24 10s. This would indicate that at some stage he had achieved the rank of corporal. 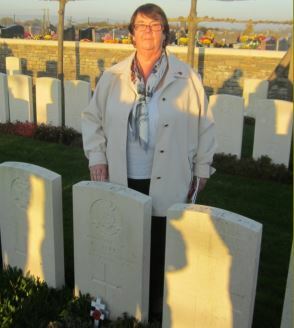 D/10208 Private Frederick Stopps, Dragoon Guards, is buried in Estaires Communal Cemetery, Nord, France. He is remembered in the London War Memorial Project in Peckham, London, but is not on any memorials in Thame.